Delicious Asian beer pairings, from grilled lamb salad with cumin vinaigrette and Chimay Blue to pan-seared shrimp and Orval. 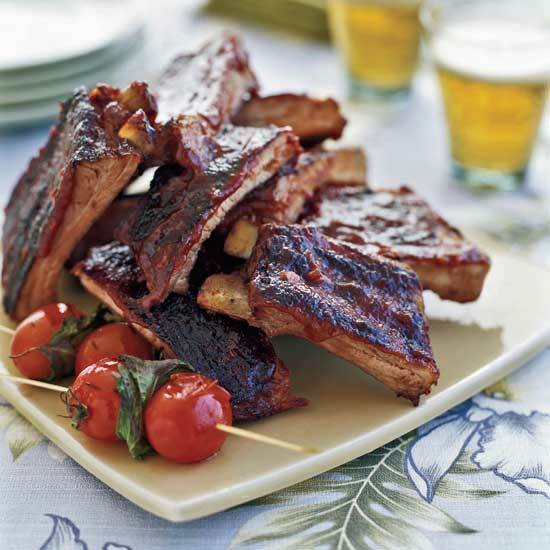 These Chinese-style ribs are glazed with a deliciously sweet-and-salty guava barbecue sauce. Pairing: A fruity, peppery Belgian ale, like Orval. 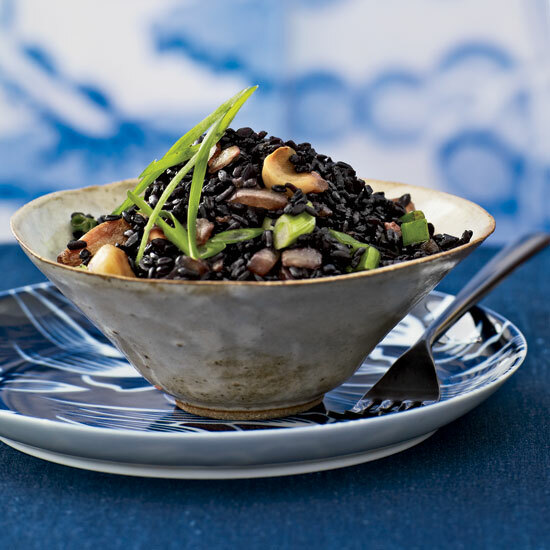 For a robust take on the Indonesian fried rice dish nasi goreng, Sang Yoon stir-fries black rice, sometimes called forbidden rice, with bacon and roasted garlic. "You can make it with short-grain brown rice, but you'd miss a lot of the fun," Sang Yoon says. Pairing: The nutty rice would be terrific with a rich Trappist ale like Rochefort 10, but a sturdy American porter like Anchor Porter would also be great. 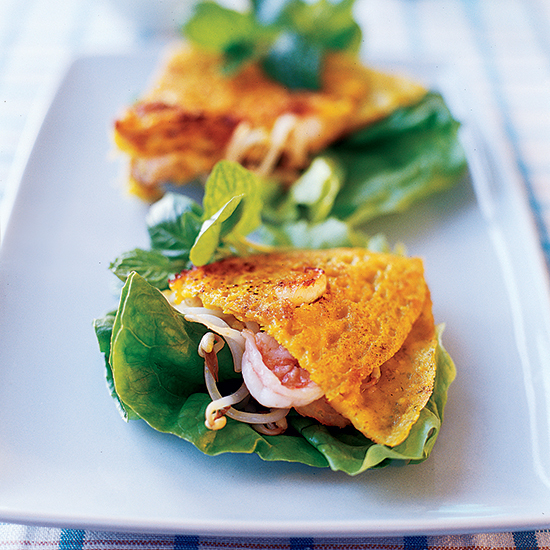 Charles Phan, the chef and owner of San Francisco's Slanted Door, thinks the perfect crêpe should be lacy thin and crackly crisp. After years of obsessive experimentation, he recommends refrigerating the batter overnight, so the starches have time to relax, then cooking the crêpes in a nonstick pan. Pairing: Vietnamese beer such as "33" Export, or Tsingtao from China, would be a terrific companion for this crispy dish with its sweet and spicy sauce. 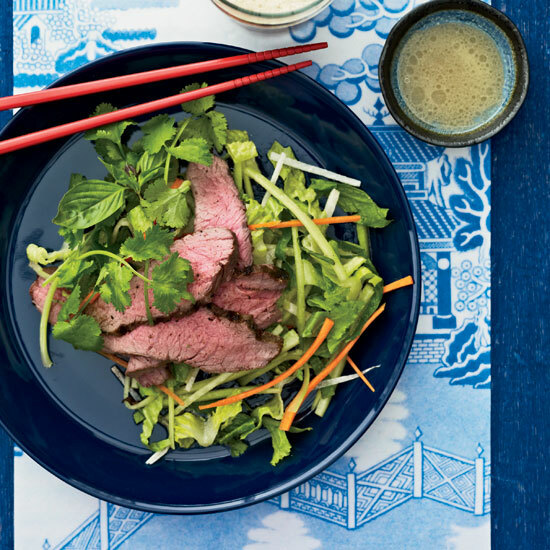 For a pretty blend of colors as well as flavors, Sang Yoon lays slices of cumin-spiced lamb on a bed of jicama, carrot and lettuce. "Lamb seasoned with cumin is very Indian, as well as Sichuan and Yunnan. But no one in Asia would serve lamb on a salad; that's just me being Californian," Yoon says. Pairing: The ideal pairing for the luscious meat: a big Trappist ale like Chimay Blue. "A few years ago," Sang Yoon recalls, "I caught a cold and my friend Sal Marino invited me for a bowl of stracciatella alla romana, the Italian soup with egg strands and semolina. 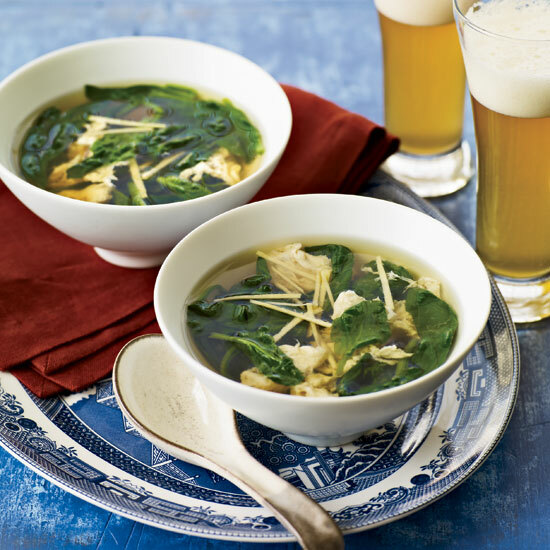 I went home and made my own ghetto version with broth from a box, and realized it would taste even better with ginger and spinach." Pairing: Sang Yoon likes to pair dark leafy greens, like the spinach here, with saisons (tangy Belgian farmhouse ales) like Saison Dupont. 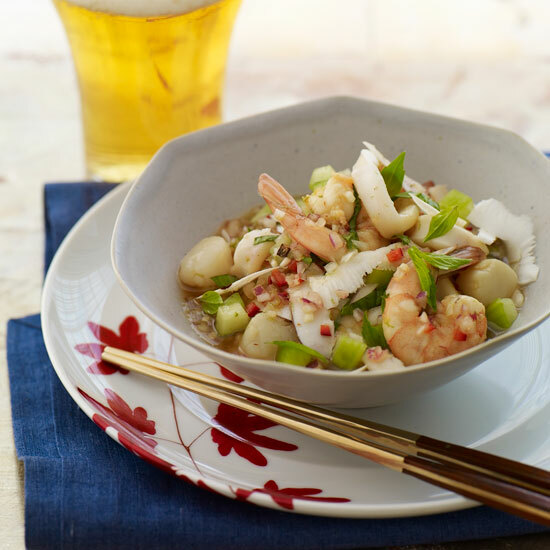 Pairing: "I love any spicy dish with a frothy tripel," Yoon says. Try Brouwerij Bosteels' Tripel Karmeliet. 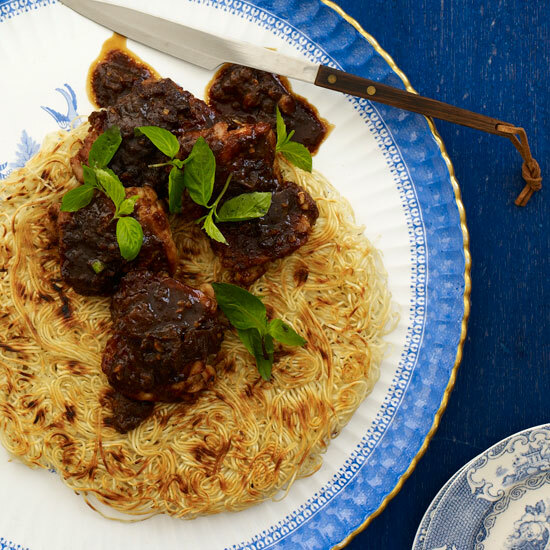 Sang Yoon's succulent chicken, glazed with an Indian-inflected blend of tamarind, vinegar and chile, sits on a pan-seared cake of slender Chinese egg noodles. The glaze is terrific with any poultry. Pairing: "The slightly sour tamarind chicken is great with the gentle flavors of a dubbel (a malty ale) like Maredsous 8," Yoon says. Sichuan peppercorns gives this quick and healthy shrimp dish a nice touch of heat. 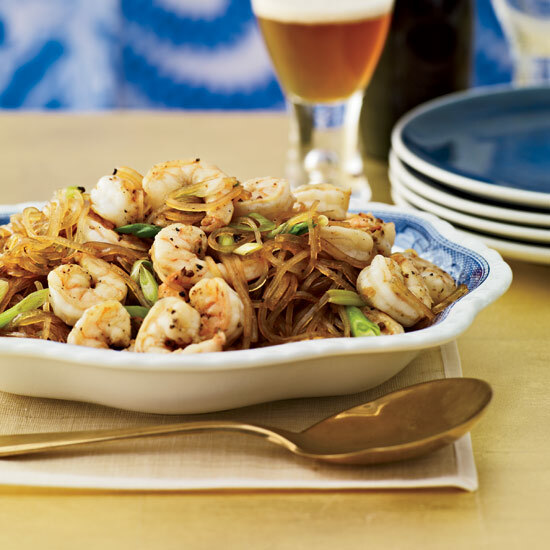 Pairing: This spicy noodle dish is terrific with a glass of Orval. The Trappist ale, Sang Yoon says, has an unusually light candied-orange flavor that's delicious with the citrusy Sichuan peppercorns flavoring the plump shrimp. 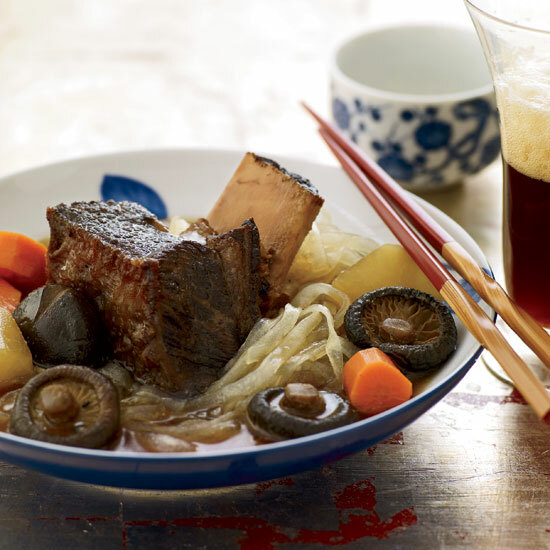 These tender short ribs are served in an intense broth made sweet with mirin and brown sugar and dark with soy sauce and sherry. "This is a variation of a Korean dish called kalbi tang," Sang Yoon says. Pairing: For a beer match, Yoon recommends a caramelly dubbel such as Westmalle. 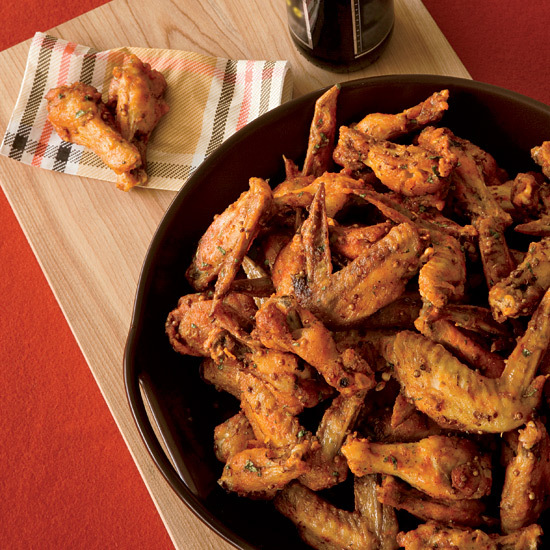 These crispy chicken wings get their heat from Sriracha, the Thai hot sauce that chef Michael Symon says is his favorite in the world. "We always have a couple of extra bottles at home, because my stepson blows right through the stuff." Pairing: Spicy food generally goes best with crisp lager beer. Symon's favorite comes from Great Lakes Brewing Company: the Dortmunder Gold Lager.